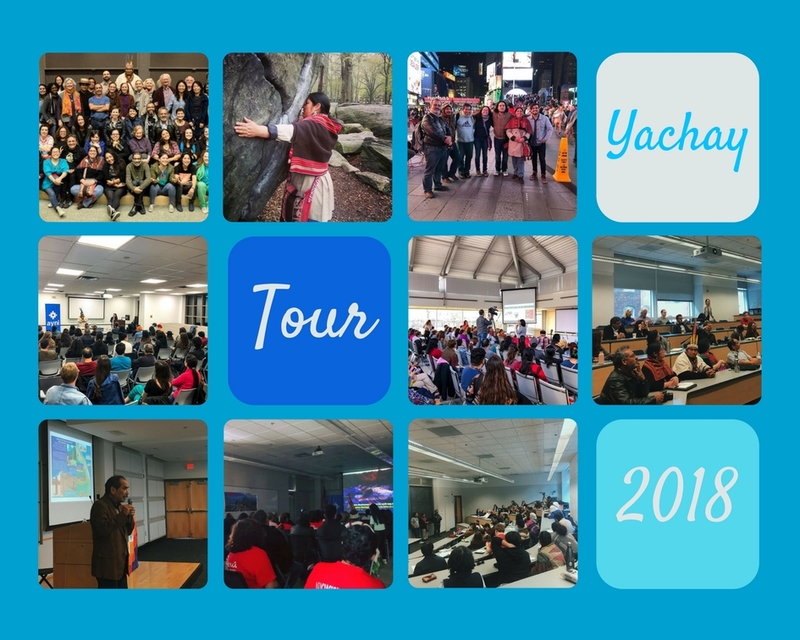 On April 19th we began our Yachay (Wisdom) Tour with our 3-day Seminar at Boston University. We engaged in cross-cultural conversations on the Amazonian cosmovision, their medicine and sacred plants; we learned about the Andean values of ayni (reciprocity), minka (collective labor) and ayllu (community); we delved into the significance and meaning of major Andean symbols in art and locations like Machu Picchu; and we hosted the worldwide premiere of Voices That Heal. We are grateful to our volunteers and the Pardee Latin American Studies Program at BU for making the Yachay Seminar possible. For the following 10 days, we traveled throughout the northeast sharing the new documentary Voices That Heal, the books The Code of Wira Qocha and The Secret Code of Machu Picchu, and answering questions about the histories, ways of life, and lessons of indigenous communities from Latin America. We’re grateful to those at Boston College (MA), Wesleyan University (CT), The Quechua Collective (NYC), and local restaurants and community centers in New Jersey (Peruvians for Progress, Pasión Peruana, Hermandad del Señor Muruhuay, and the Peterstown Community Center), East Boston (Maverick Landing) and Lawrence’s APU (MA) for hosting us along the way. The 2 weeks of the tour passed by quickly, but through the tour we were able to bring Latin America to immigrants who are not able to travel back home, we re-engaged youth who were estranged from their culture or hungry to be more connected and learn, we welcomed people from diverse backgrounds into one-of-a-kind dialogue with indigenous leaders, and we healed and brought hope to families dealing with sickness. We are extremely grateful to everyone who joined us along the way, fed us, hosted us in their homes, and supported us in getting visas for our guests. Our teachers left with their hearts full and with excitement to continue bridging and learning from each other. We are excited for them to come back in the future. 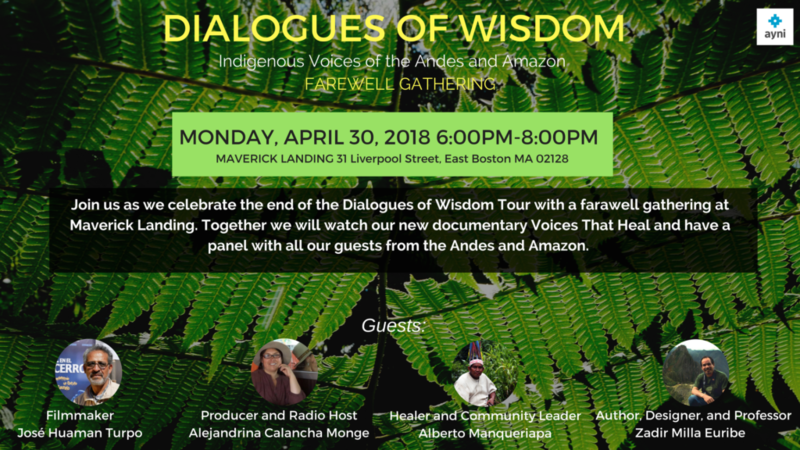 We were honored to bring four indigenous leaders from the Andes and Amazon to New England for the first time. Together we were in dialogue and we learned more deeply about the histories, ways of life, and lessons of indigenous communities from Latin America. If you want to see what our upcoming events are, visit our Restoring Reciprocity page. One of the protagonists of Voices That Heal, a documentary about four different Amazonic villages in Peru – their healing practices, their values, beliefs, and their languages, which are on the verge of extinction. 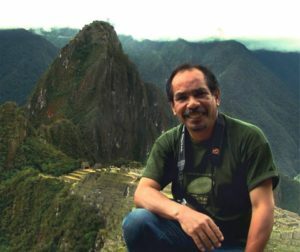 He has in-depth knowledge of medicinal plants of the Peruvian Amazon and has extensive experience in healing spiritual and physical ailments. He is an indigenous filmmaker from Peru with over 30 years of experience in all areas of production – from assisting with props, lighting, sound, and camera to directing and photographing – and has extensive experience in research and filmmaking. He focuses on making ethnographic documentaries which express the memory, legacy, knowledge and collective imagination of indigenous communities. 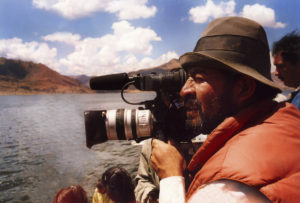 He is also Director of The Mysteries of the Andes series. 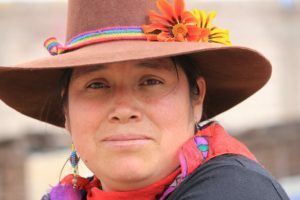 She is of Quechua origin and has academic training in Social and Linguistic Communication from the University of San Antonio in Cusco. In the 90s she was dedicated to radio journalism and still continues to host her own program in Quechua. In 2005, she began working alongside Jose through translating, editing and producing documentaries. She is also Producer of The Mysteries of the Andes series. He has immense knowledge about Andean symbols, architecture and megalithic art and will share with us the knowledge in his two books “The Wira Qocha Code” (2001) and his most recent release, “The Secret Code of Machu Picchu” (2017). 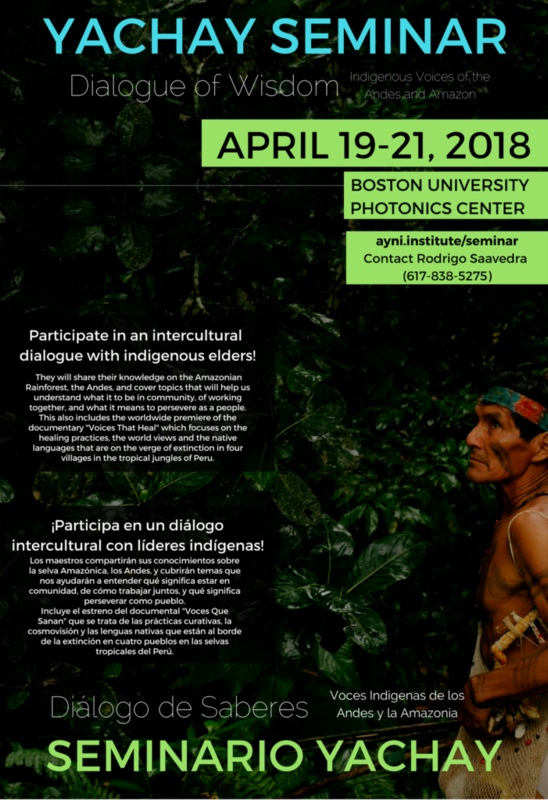 With the support of Boston University’s Pardee School of Global Studies Latin American Studies Program we are hosting a three day seminar with four indigenous elders of the Andes and Amazon. We will be bridging together two nations as we host events to immerse participants in art, culture and wisdom of indigenous communities of the Andes and Amazon of Peru. We will also premiere Voices That Heal, a documentary on the languages and healing practices of four indigenous communities of the Amazon. To learn more the seminar, the Voices That Heal Premiere, and purchase your admission to the seminar click here. 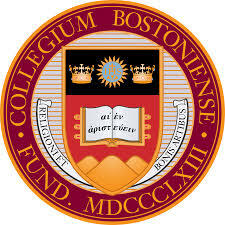 We will be screening “Voices That Heal” at Boston College on Monday April 23rd at 6:00PM. 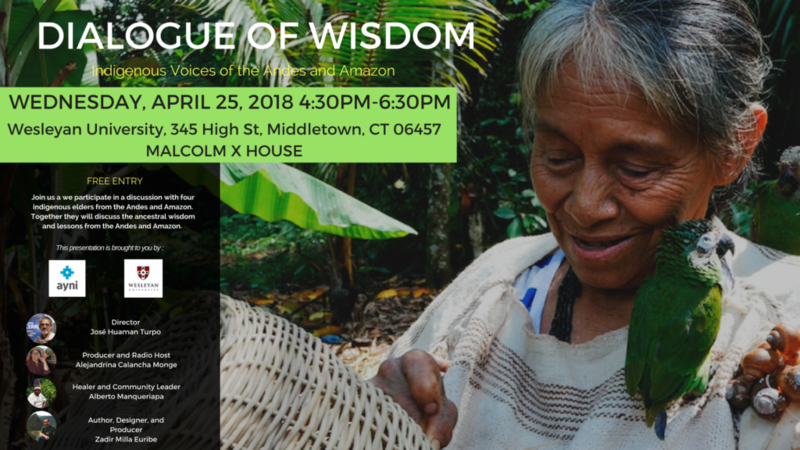 Joining us will be Producer Alejandrina Calancha Monge and Director José Huaman Turpo who for the past year have worked on with four indigenous communities of the Amazon to document their healing practices and ways of life. 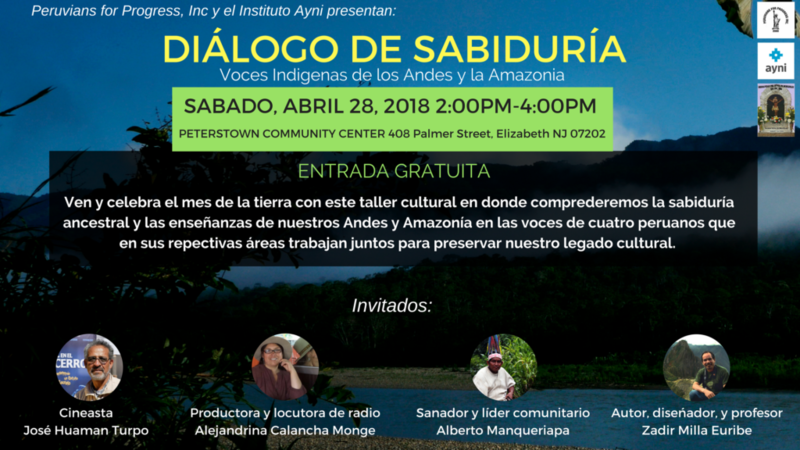 Protagonist, Community Leader, and Healer Alberto Manqueriapa will be joining as well to discuss more deeply his communities in the Amazon of Paucartambo, Peru. Joining them is Zadir Milla, professor, artist and author who will provide rich context to the film as it relates to other indigenous communities in Latin America. To learn more about the Screening and address click here. With the support of Wesleyan University and AJUA Campos Student Group we will host a two hour session in Connecticut. 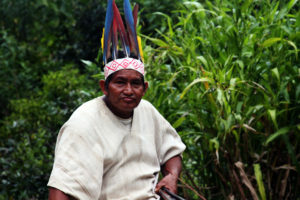 Join us as we speak about issues related to indigenous communities in the Andes and Amazon. 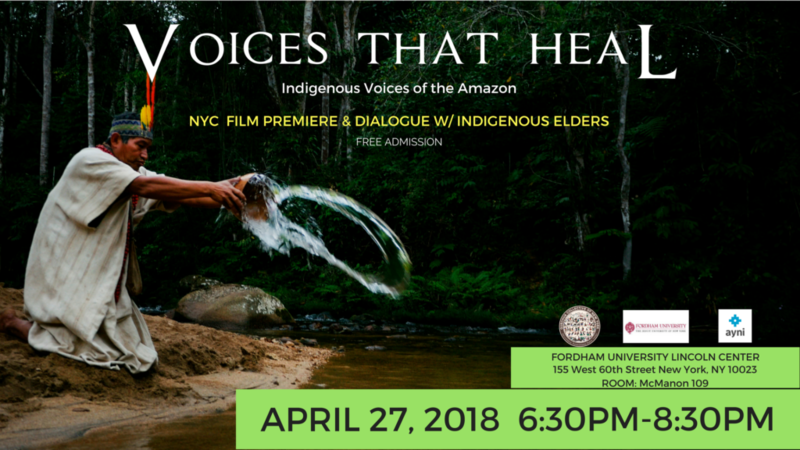 With the support of Fordham University’s Anthropology and Sociology Department and NYC’s Quechua Collective we will host the first ever screening of Voices That Heal in New York City. Join us and our guests as we watch the film together and answer your questions. The film will be subtitled in both English and Spanish. With the support of Peruvians For Progress, Inc we will host a presentation and panel on topics relating to indigenous communities with our four guests. The event will be in Spanish. 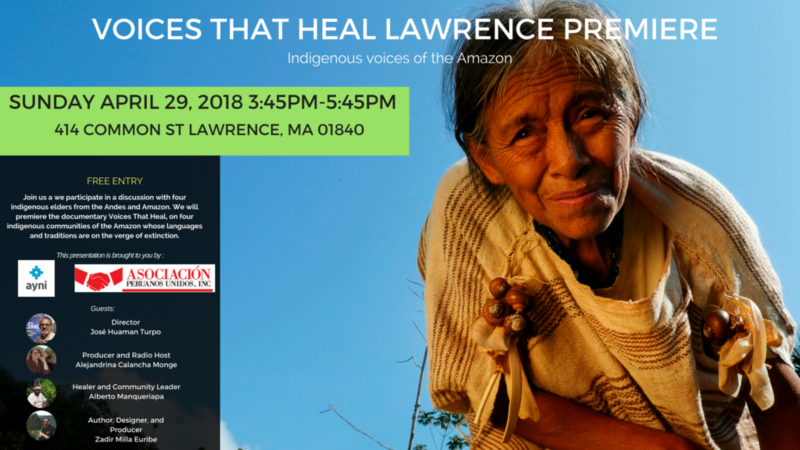 With the support of the Asociación Peruanos Unidos, Inc we will host the first ever screening of Voices That Heal in Lawrence, MA. Join us and our guests as we watch the film together and answer your questions. The film will be subtitled in both English and Spanish. The event will be mostly in Spanish. With the support of Maverick Landing we will host a farewell gathering with our four indigenous guests before they return to their homes in the Andes and Amazon.